Self-styled international revolutionary Carlos the Jackal has gone on trial in Paris over four bomb attacks in the early 1980s that killed 11 people. Carlos, a Venezuelan whose real name is Ilich Ramirez Sanchez, will appear before a panel of magistrates for a trial expected to last six weeks. 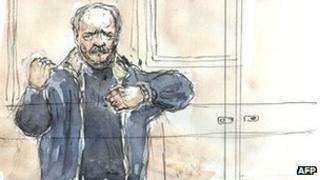 The 62-year-old is already serving a life sentence in France for the murder of two policemen in 1975. He was captured by French special forces in Sudan in 1994. By the time of his capture, he had earned global notoriety as a mastermind of fatal bomb attacks, assassinations and hostage-takings. His most infamous act was leading a raid in Vienna in 1975, when his group took 11 ministers of the Organisation of Petroleum Exporting Countries (Opec) hostage. Ramirez looked relaxed in jeans and a blue jacket for the first day of his trial, with dozens of journalists and a motley collection of well-wishers filling the packed courtroom, AFP news agency reported. "I'm a professional revolutionary," he told judge Olivier Leurent as the proceedings got under way. The new charges relate to four deadly attacks in France in 1982 and 1983, which killed 11 people and wounded another 100. Prosecutors allege he carried out the attacks in order to pressure the authorities to release two of his accomplices, including Magdalena Kopp, who became his first wife. They had been arrested in Paris on suspicion of planning to attack the Kuwaiti embassy. The first bombing, in March 1982, took place on board a train between Paris and Toulouse, killing five people and wounding 28. It was followed a month later by the car bombing of an anti-Syrian newspaper in Paris. One passer-by was killed and 60 injured. The other two bombings took place on New Year's Eve 1983, with a bomb on a TGV fast train between Marseille and Paris that killed three people and wounded 13, and a bomb at a Marseille train station that killed two. Some 20 witnesses, including family members, experts and former accomplices, are expected to be called, during the trial, the AFP reports. Ramirez denies he had anything to do with the bombings. If found guilty, he could face another life sentence in prison. On Sunday, he told Venezuelan newspaper El Nacional that he had carried out more than 100 attacks, but said there had been "very few" civilian casualties. "I calculated that they were fewer than 10%. So out of 1,500 to 2,000 killed, there were not more than 200 civilian victims." Ramirez was born into a wealthy Venezuelan family, and studied in Moscow before joining the Popular Front for the Liberation of Palestine. He converted to Islam in 1975. His links to such high-profile incidents as the Opec hostage-taking and the Palestinian hijacking of a French airline to Uganda in 1976 helped to make him the face of international terrorism during the 1970s and 1980s. He got his nickname after a copy of Frederick Forsyth's The Day of the Jackal was found among his belongings. Ramirez was seized from a hospital room in Sudan in 1994 and hauled to Paris inside a sack by French agents. In 1997, he was sentenced to life imprisonment in France for the 1975 murders of two French intelligence agents and an informer. Ramirez will be defended in court by Isabelle Coutant-Peyre, his lawyer from his original trial, whom he married in a Muslim ceremony in jail 10 years ago.